Sri Lanka FTAs: stupidity or treachery? Recently, the President of Sri Lanka expressed that his government will safeguard the local industrialists. In several occasions, he has mentioned that the government does not want to go for trade agreements that are deleterious to the country’s economy. However, on 23rd of January 2018, the president was seated in the high chair clapping when the bilateral trade agreement with Singapore is signed, which liberalized the country’s service sector effectively for the first time. Singapore Trade agreement is a "stupid" agreement. The Ministry of Trade and Industry of Singapore expressed the pact has saved at least 10 million USD per year for Singapore. This means that the government of Sri Lanka losses at least 1500 million rupees of annual tax revenue by imports from Singapore. What Sri Lanka got in return from this agreement is hilarious as 99% of the goods which were included in the Singapore offer to reduce tax for Sri Lanka were already tariff free in Singapore for any country including Sri Lanka. This reflects the stupidity of the officials who are negotiating these pacts. The Rule of Origin which measures the value addition by the partner country to a certain product to be eligible for the tariff wavering has been poorly incorporated in the agreement. This will encourage transshipments leading to goods manufactured in other countries to flow to Sri Lanka via unilaterally tariff free Singapore. This will be a grave blow to the local producers though the president insists that the local producer should be defended against foreign investments and products. 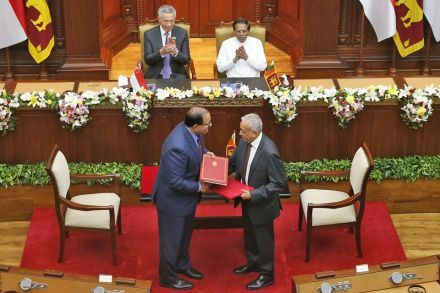 The only benefit the Ministry of Development Strategies and International Trade of Sri Lanka had to mention about the Singapore-Sri Lanka Free Trade Agreement was that it could give the world a message of Sri Lanka’s openness to the international trade. However even the so-called benefit was nullified when majority of the Sri Lankans abnegated the government’s economic policy via the local election poll few days after signing the FTA. The guideline published by Asian Development Bank named “How to Design, Negotiate and Implement a Free Trade Agreement in Asia” suggests conducting national feasibility studies, impact assessments and public hearings afore starting negotiations with the counterparts. Infelicitously for Sri Lanka, none of these has performed by the authorities concerned. All they wanted was to complete the trade agreements at any cost to the current and future generations of Sri Lanka. Meanwhile the next round of talks for the controversial Economic and Technology Co-operation Agreement (ETCA) between India and Sri Lanka which is yet to be concluded, will be held from May 23rd to 25th in Colombo. In an interview with a newspaper. the lead negotiator of Sri Lanka for ETCA, Mr. K. J. Weerasinghe, expressed that “It is a decision by both the governments at high political level that ETCA should be negotiated and completed.” In other words, he says that they are not responsible for the consequences of this economic pact and they are conducting the negotiation process because of a political decision. When the writer asked Mr. K. J. Weerasinghe, who is responsible for the consequences of this agreement, the latter replied, it is the Cabinet who will make the final decision and they should be responsible. We all know that Sri Lanka-Singapore FTA was approved by the Cabinet of Sri Lanka without properly studying the content or the consequences. In such a background, the President’s eminent declaration that the government won’t sign agreements unfavorable to the country is likely to become just a few floating words. In the sake of current and future generations of Sri Lanka, we should all demand and protest for the justice, transparency and rationality that the regime has been vociferously promised but totally ignored in the process of entering into economic agreements which will have a huge impact to the lives of everyone. The direct impact of a trade agreement is on the Balance of Payment account of the Central Bank annual report. Quite simply, balance of payments reflects how the money have been flown in and out of the country during the year concerned. When there is a deficit in the current account which is a part of the balance of payment, that deficit must be balanced out somehow. In the current account, Sri Lanka’s annual trade deficit, the gap between imports and exports is around US $ 9 billion out of which nearly US $ 4 billion deficit ensue by the trade with India. That is outflow of money due to commodity trading with India in a single year is four times as much as the money inflowed by Hambanthota port which located in the center of the maritime silk route, being sold for 99 years. India is very keen on reducing the trade deficit with China and it is not interested in entering a free trade agreement with China though the latter is their biggest trading partner in the region. The reason is quite simple. China is too competitive for India in cost of production, Production capacity and comparative advantages. Sri Lanka on the other hand, having all these disadvantageous and being too small for a tariff free competition is still incoherent enough to negotiate bilateral free trade agreements with both these giants not only for commodities but also for services as well. India is taking advantage of Sri Lanka’s harvest even before signing ETCA. Recently, Sri Lanka agreed to provide laundry service of the hospitals of the Western province to an Indian company. Many misunderstand that ETCA will bring a solution for labor shortage issue in certain industries, but it is not. ETCA and this type of agreements are articulated to get the market access for bigger players like multinationals replacing the small and medium entrepreneurs in local markets and to obtain government owned institutions when they are privatized. Indian companies will replace Sri Lankan entrepreneurs, CEOs, managers, clerks and laborers with their men. Laundering service agreement with an Indian company is a good prototype to understand what would happen in all other sectors like education, transportation, financial services, sanitary services, energy, telecommunications, entertainment, information technology and tourism. Nobody has estimated or care about the number of job losses to Sri Lankans from these FTAs. In the current context, net value of US $ 6.5 billion annual inflow of foreign remittance is there to cope up with Sri Lanka’s US $ 9 billion annual trade deficit. The positive inflow of foreign remittance is recorded under a great deal of social cost as almost half of the remittance is received from Sri Lankan women working in the Middle East countries. If ETCA is implemented, many Indians will serve in Indian service companies or branches put on Sri Lanka, sending a large amount of money back to India, reducing the net value of foreign remittance. It is quite clear that ETCA will increase the amount of money leaving Sri Lanka as trading of commodities, services, and remittances. As a result, the current account deficit in the balance of payment account will be increased. The deficit in the current account of Sri Lanka will have to be balanced out in the financial account where the impact can be seen. Foreign reserves will be decreased. The rupee will be further depreciated. National assets which are regular income sources will have to be sold to cope up the deficit of a single year. Foreign debts will be increased. The control of the of the economy will be further loosen from the Sri Lankan government and the foreign powers will start imposing many conditions on Sri Lanka. They will decide what are the national assets and institutions that Sri Lanka should sell. They will start advising us on how our constitution should be changed with greater authority over us using the increased soft power over Sri Lanka. They will advise or even decide what we should do for alleged war crimes and human right issues. A veracious person does not require to count the months to understand that the ETCA is deeply detrimental to Sri Lanka’s economy. Consequently, the President should decide to culminate the ETCA negotiations with India, diplomatically bringing the conversation of immense bilateral trade deficit with India following the current global trends in international trade. Otherwise it is inevitable that the president will have to clap when the treachery ETCA is signed, seating in a high chair on the stage.